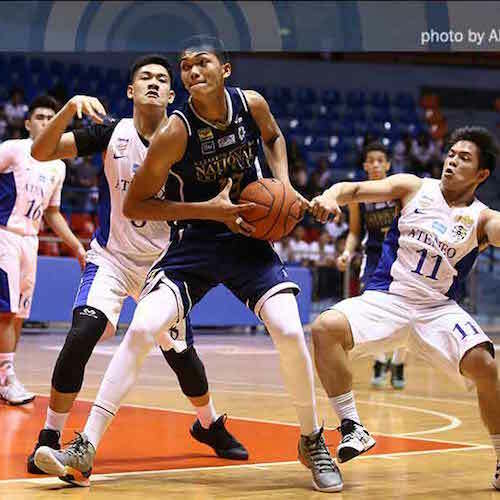 Justine Baltazar towered over the competition anew in the UAAP Juniors Division. 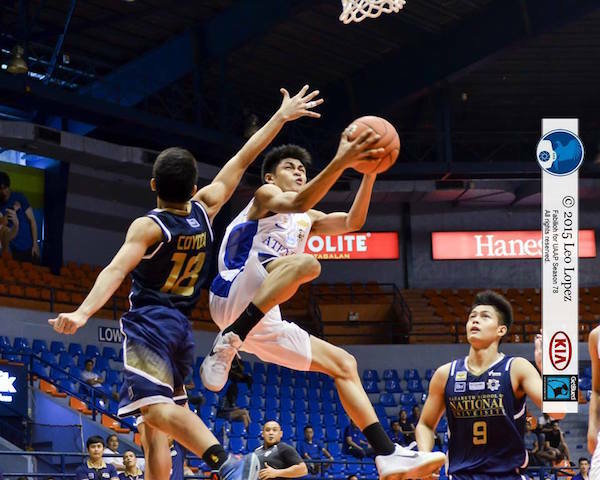 National University reasserted its mastery of defending champion Ateneo, 81-69, to extend its unbeaten run to eight games yesterday in the UAAP Season 78 juniors basketball tournament at the Filoil Flying V Arena. John Lloyd Clemente finished with 21 points, 13 rebounds, and 2 assists, while Justine Baltazar had a monster outing of 15 points and 20 rebounds as the Bullpups followed up their 73-60 conquest of the Blue Eaglets in the first round. NU led by as many as 25 points, 70-45, early in the fourth and never looked back. Gian Mamuyac paced Ateneo with 19 points, 9 rebounds, and 4 assists, SJ Belangel had 17 points and 7 boards, while Jolo Mendoza, who was held scoreless by NU in their first round meeting, and Shaun Ildefonso chipped in 14 markers apiece. Gian Mamuyac goes up for an acrobatic shot. 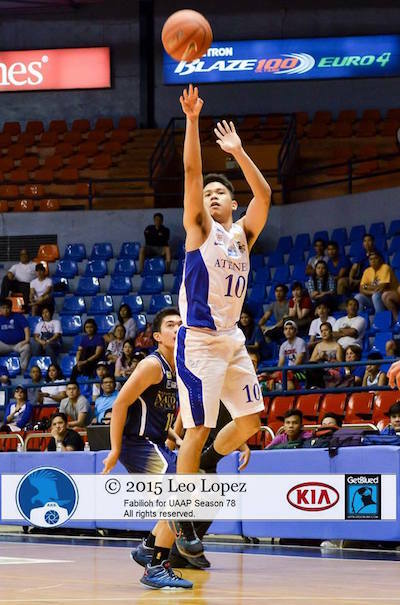 Jolo Mendoza struggled again from the field against NU. Ateneo dropped to 5-3, yielding the second spot to De La Salle-Zobel, which fashioned out a 78-58 win over Far Eastern University-Diliman. Aljun Melecio shot 41 points, nearly matching his season-high 42 against the Eaglets on opening day, and grabbed 10 boards as the Junior Archers booked their sixth win in eight matches at the expense of FEU, 78-58. Aljun Melecio continues to score with impunity for the Junior Archers. 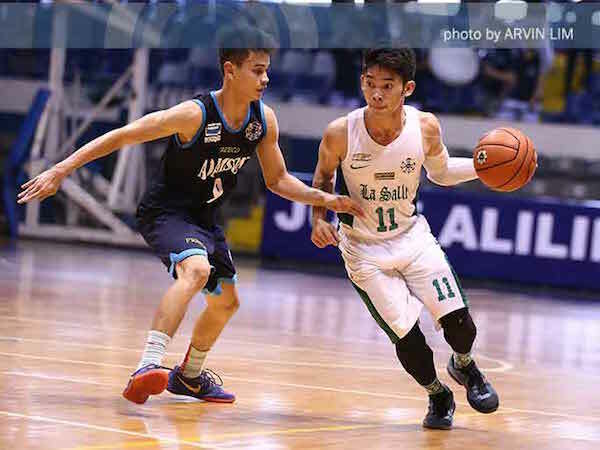 Marco Sario continued to impress for DLSZ, scoring 13 points and handing out 7 dimes for the victors. The Baby Tamaraws, who were led by Kenji Roman with 14 points and 13 rebounds, suffered their fifth defeat in eight starts to slip to fifth place. Meanwhile, Jayson Celis and Jose Antiporda combined for 21 points as Adamson University subdued UP Integrated School, 66-61. The Baby Falcons tied the Eaglets at 5-3. Jaggy Gregorio paced the Junior Maroons with 13 points as the Gomez de Liano brothers shot just a combined 3/20 from the field. Earlier, University of Santo Tomas nipped University of the East, 95-94, with Miguel Ratuiste finishing with 22 points, 7 rebounds, and 3 assists. The Tiger Cubs moved up to sixth place, the Junior Maroons fell to 1-6, while the Junior Warriors remained winless in eight contests.